Nachos for breakfast? Yep. 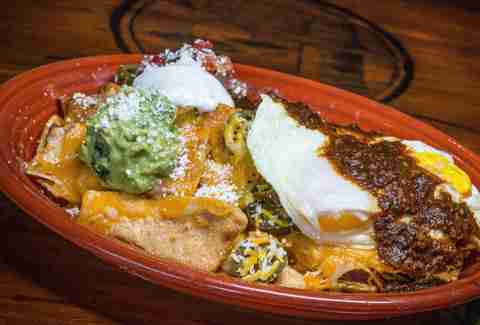 Cabo Wabo has a new South-of-the-border breakfast menu that includes the Huevos de Nacho. It’s a plate of cheese nachos topped with two fried eggs, guacamole, sour cream, and pico de gallo. The Pancake Tower is a skyscraper of carbs, protein, and sweet maple syrup. 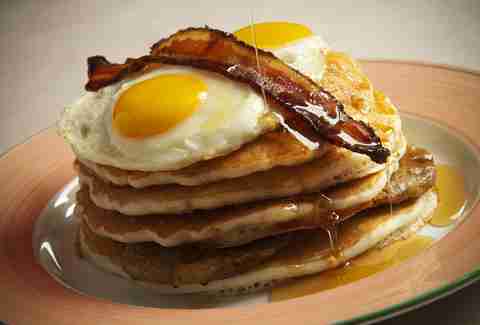 It's four pancakes, three sausages, two fried eggs, and one slice of bacon. How much food can you fit on one plate? 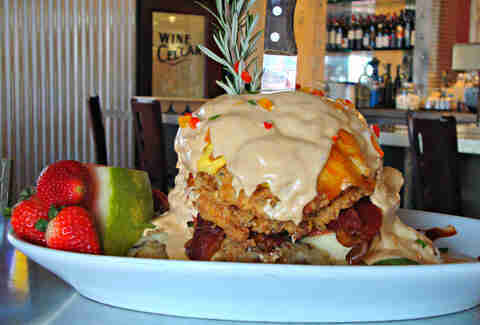 Andy's Sage Fried Chicken Benedict is served with a maple reduction, two eggs, bacon, mashed potatoes, and a homemade split biscuit, so at least that much, apparently. 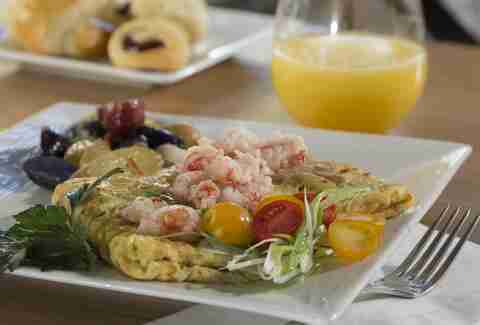 The Langostino Omelette is the best bite of breakfast you can get for just $10. 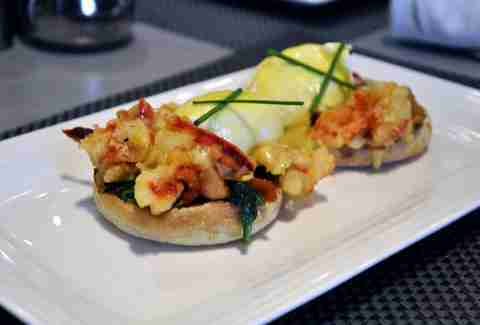 The serving of organic eggs comes with diced lobster tail, spinach, and tomato covered in hollandaise sauce. You might normally find crunchy lobster tempura on a sushi roll, but now you can also have it for the first meal of the day. 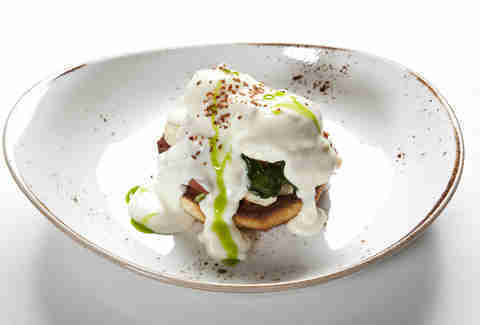 The Lobster Tempura Benedict at the Market Café comes with sautéed spinach and smoked bacon. EAT is quickly earning a reputation as possibly the best place to grab a morning meal thanks to simple recipes made from local and sustainable ingredients. 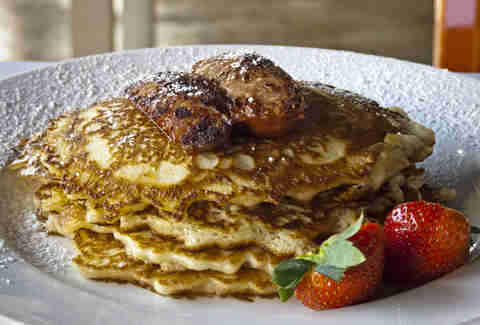 The pancakes with chicken apple sausage are almost as sweet as the made-to-order beignets. 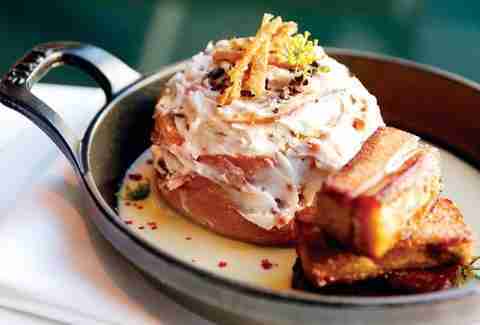 The Duck Confit Cinnamon Roll comes with smoked bacon frosting and raspberry compote. It’s the perfect breakfast for the French foodie who has already seen it all. Why wait until lunch for a burger? 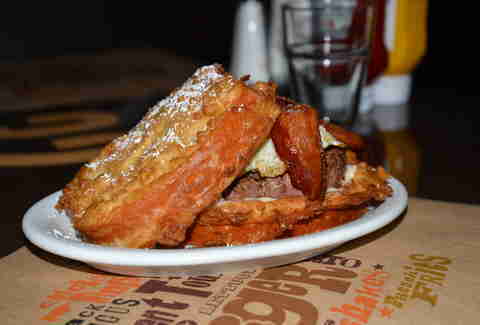 Especially when said burger is sandwiched between two thick French toast slices and topped with maple cream, sausage, bacon, and a fried egg. The Pulled Pork and Waffles comes with with spiced apple compote and bourbon barrel aged maple syrup for a Southern BBQ twist on brunch. Oh, and it comes with an endless Bellinis, mimosas, or Bloody Marys for $19.98, too. 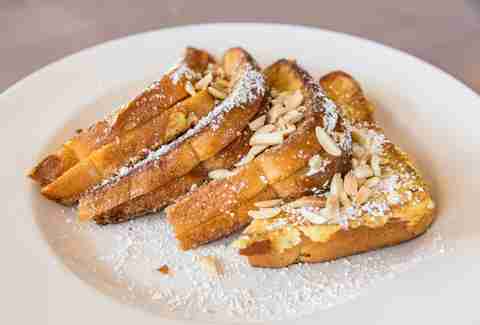 The Brioche French Toast is filled with Orange di Stefano Mascarpone and topped with almonds, whipped butter, and maple syrup. It’s the perfect excuse to carbo-load while you enjoy the breeze from the floor-to-ceiling windows that open up for the weekend brunch. 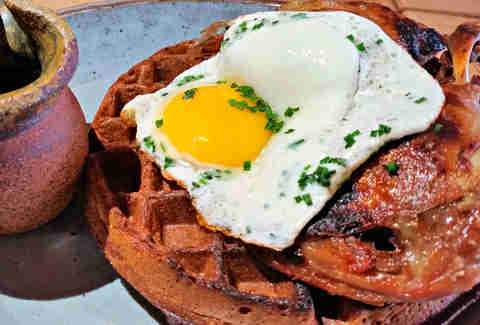 The Duck & Waffles is among the creative bites on the new brunch menu. 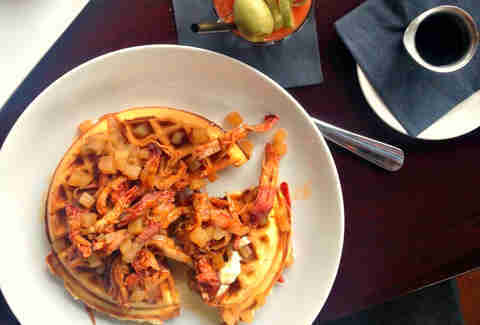 The whole wheat and rye waffles come topped with crispy duck confit and maple bourbon syrup. Wash it down with a Bellini fueled with sparkling wine and peach cider or a choose-you-own concoction from the Bloody Mary cart. 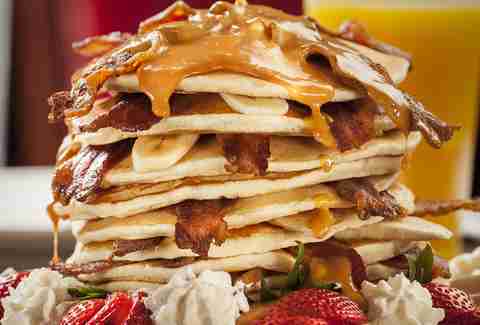 A breakfast that Elvis himself would appreciate: The King is a giant stack of 14 fluffy banana pancakes, 14 strips of crispy bacon, a drizzle of creamy peanut butter glaze, and maple syrup. 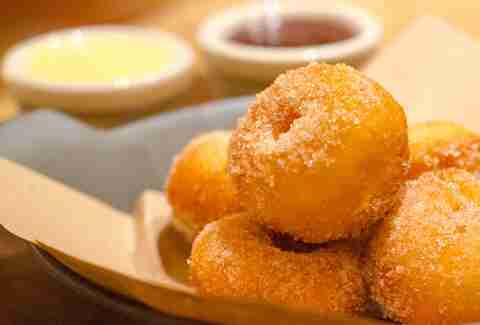 These house-made donuts are soft, sweet, and served warm. They come with chocolate, vanilla bean, and berry dipping sauces to fully maximize your caloric intake. A familiar breakfast staple comes with a seafood twist. The Blue Crab Benedict layers homemade brioche with farm-fresh spinach, roasted tomatoes, crab meat, and a perfectly poached egg… followed by Mornay and brie sauce. 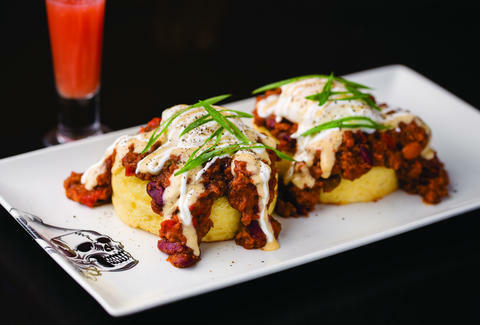 In a stroke of genius where creativity meets indulgence, the Dragon’s Breath Chili Cornbread Benedict features sweet cornbread topped with Dragon’s Breath Chili, house white cheddar cheese sauce, scallions, and two soft poached eggs.